Mall-a-Palooza is rated 4.5 out of 5 by 17. Rated 5 out of 5 by graceland9 from SO much fun! There's nothing like being late to the party. 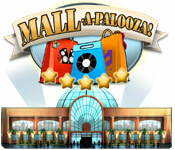 Why, oh why haven't I played Mall-A-Palooza before? It's a blast building stores and hiring workers. Not only that, and this is what made it a must-buy for me, each round of play continues to the next. So, if you hire a janitor for 2400$ in the first round, lo and behold there he is, still sweeping up after all the sloppy shoppers, in the next. LOVE that, and it's pretty unique. I found this was similar to Build-A-Lot and Green City (without all the annoying 4x3 /2x2 grids I can never memorize or fit into my existing lots.) This is a keeper for me. Rated 5 out of 5 by SpikyFish from One of my favourites I've been Big Fish Game member for years and this is one of the few I've played 3 or 4 times. I wish the developers would make a sequel. Rated 5 out of 5 by tokengame from Fun and replayable This is a great game, I have replayed it at least 3x over the 5 years since I originally bought it. There are 5 levels in each of 9 chapters, each chapter presents to you a different empty mall and a series of "challenges" that you have to meet by building the stores, upgrading, and adding amenities, etc, in the time allowed in order to win the level. There's enough different things to do that it doesn't get old and it's rewarding/challenging enough to be really addictive. You can easily play this game for weeks. You won't be disappointed if you like simulation/tycoon type games. Rated 5 out of 5 by missmeliss5 from Wish there was a second one! This is a hybrid time management/strategy game. I like it much better than the regular time management games because you can be more creative and have to be more strategic about achieving the goals (instead of just being fast). Rated 5 out of 5 by stakky from Brilliant - need another one to follow on! I loved this game and often come back to it. Hope they bring out another one to follow on!! Rated 5 out of 5 by Cheri_BDG from Better than I expected! 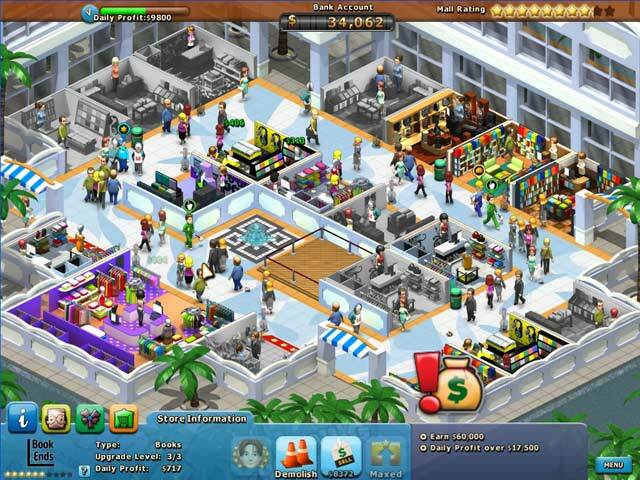 When I first saw the name of this game, I was expecting a Tycoon type game where I'd be building a mall, designing layouts, trying to decide where to place every little thing which was usually more detail than I wanted. I was pleasantly surprised to find this game cut to the interesting parts of what I usually like in tycoon games, growing my empire and making it better! You buy and grow stores, trying to get the star level of each store up as high as possible to attract your customers, and make money. Stars come from hiring the best employee, setting up shop near others of the same type (apparently competition helps everyone?) having decorations placed nearby (just a couple possible spots per store to place) and other things. 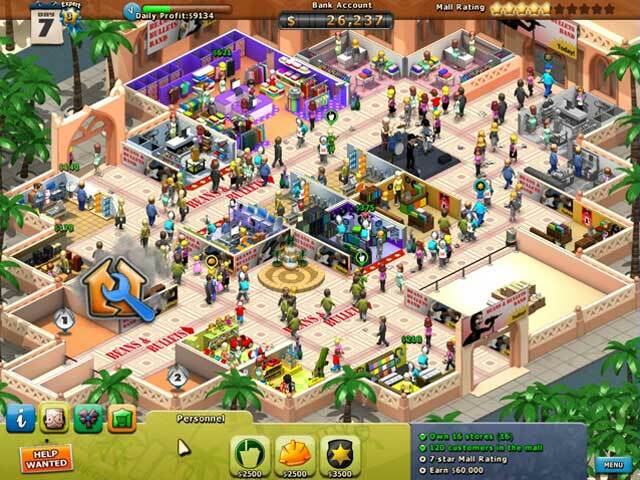 In addition you can boost the mall's total value, increasing the shop sales in all shops of the mall, by keeping the mall attractive and clean. 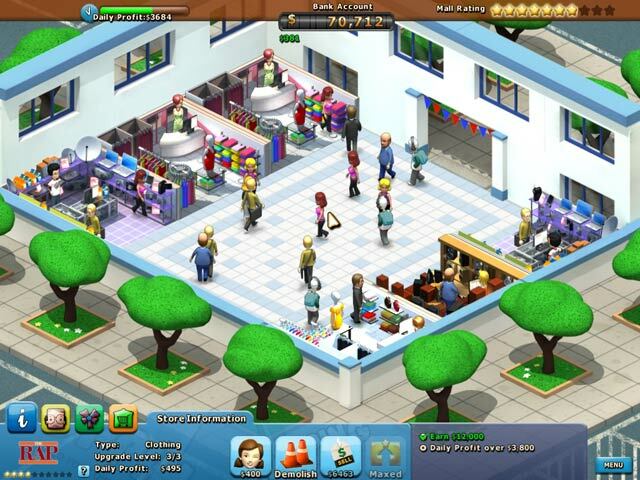 Buying and selling shops is possible, and usually the end goal is to own all the shops in each mall, before you move on to the next mall in the story. A lot of fun, and on my wish list to buy soon! Rated 5 out of 5 by ashleync from Addicting I loved the game! Only problem was there aren't enough levels. I finished the whole game in 2 days. Rated 5 out of 5 by virtuescoaching from A game you can play over and over again! I love this game! I bought it a long time ago, and I still play it over and over again. It's a REAL time management game - not like some of the ones I've seen lately where it's like match-3 mini games or hidden object games. This is a game that the scenario changes each time you play it. I love it! Def worth purchasing!! Wish they came out with a 2nd one! Rated 5 out of 5 by angel_whisper from I love this game !!! This game gives me much fun and dream. I'm waiting for Mall-a-Palooza 2.